Eleventh Hour Moments: Who Wants a Robot Boss? The Sunday Times is one of my favorite reads. Even if I think it's a liberal rag! Well today The Times has a cool article about having a "robotic boss." There are pros and cons to this idea. We really should review these now...before you go back to work after your awesome Labor Day Holiday and find a robot with a picture of your boss' face on it rifling through your desk! Let's prepare! You can do things behind the robot's back. It takes a long time for a robot to turn it's whole self around! This feature gives you ample opportunity to move around the room, flip your robot boss the bird, make obscene gestures, and accidentally knock it over! It's easier to cry in front of a robot than a real human. No, really, it's true! Go ahead and lay the guilt trip on your robot boss. Bawl your eyes out! What's the robot gonna do? Pat you on the back with it's stainless steel claw? Confuse the hell out of the robot with emotions! Remember Will Smith's creepy robot movie I, Robot ? You can be the boss of a robot too! You can get a Robot to clean your house instead of worrying about hiring an illegal immigrant! With all the issues going on now with illegal immigrants, it's a good idea to stay away from this explosive controversy. You just might get sued or something! Not to mention, it's just not the politically correct thing to do...or is it? And, don't forget...robots can disarm bombs and perform dangerous missions like sealing the BP well. That damn robot boss can sit next to you in your cubicle all damn day! It's that whole big brother thing! Say good-bye to water-cooler gossip fests...say good-bye to shopping on line, checking personal email, napping, listening to your ipod, reading magazines, goofing off, playing video games, chatting on the phone...all the things we go to work to do! Robots can break, get their parts accidentally stuck in the closing elevator doors, and fail at the most important moments...like capping that BP well! And when they do break, you've got to pay some MIT geek graduate lots of dough to fix the thing! They use batteries, electricity, and all those things Al Gore says we use too much of! I wonder if Mr. Gore hires robots?? I haven't seen any solar powered robots yet have you? In keeping with the politically correct circles, it would look really bad if you claimed to be a "green-tree-hugger-vegan-eating-hybrid-driving-eco-friendly-minimal-carbon-footprint-dork, AND you owned an electrical-type robot with it's own carbon footprint! Best not to buy a robot if you don't want to soil your reputation...right Mr. Gore? Now we are prepared for any robotic changes that may come our way! I certainly feel better! See...every-now-and-then, The New York Times comes in handy! 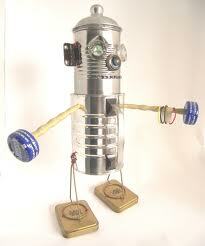 So go to my blogger page and vote...yes or no to a robot boss!? !